Holiday Home Duinzicht has an open view towards the nature park and dunes just in front of the house. In these ‘Amsterdamse Waterleiding Duinen’ you enjoy peace as the bustle of city life is far away. Here you can make long hikes through the dunes and forests. In this area you find the largest deer population of the Netherlands. Only a 10 minutes´ walk to the beach, sea and centre of Zandvoort. This semi-detached house is for max. 4 adults and 2 small children who love to take care of the cat, who is mostly in the back garden and only needs food once a day. 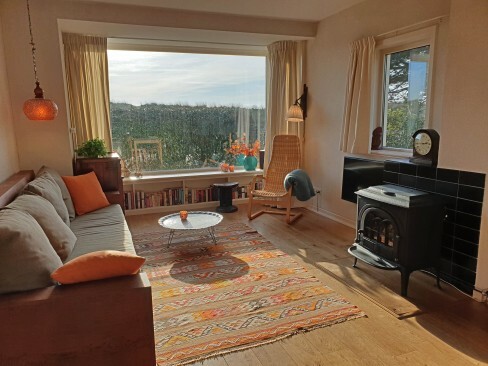 The bright living with a view across the dunes has a large sofa lounge and 2 armchairs, a flatscreen TV and a gas heater. Next to it the large dining table for 6 and the open kitchen from where you can serve your meals on the table or into the garden. The kitchen is equipped with all comfort and even has a wok burner. On the first floor are 3 bedrooms. The master bedroom is on the South with a balcony and view into the wide open across the dunes. The bathroom is basic, with a shower and sink. On the ground floor there is a separate toilet. The washing machine and dryer are in the shed in the garden.You can park your car for free around the corner. Ie: no tourgroups with more than three people aged between 16 and 26 years. Questions about Holiday Home Duinzicht 394?